The Reebok Furylite Sole is available at a very budget-friendly price point. A large percentage of the users felt comfortable while wearing this kick. Many shared that this pair is great to travel with. Most of them enjoyed the lightness of the Reebok Furylite Sole. One even described the experience as the most natural feeling of walking with a shoe on. Several users revealed that they will highly recommend this pair to their friends. A handful of users praised the quality materials used on the Furylite Sole. A number of raters were happy to share that this pair looks better in the actual. Few noted about the removable insoles. They specifically liked this as they could change it with their preferred orthotics. Many liked the ventilation of this shoe. This kick generally runs true to size. Many noted the versatile colorways available in the market. Its slip-on feature was applauded by some ladies who are always on-the-go. A couple of raters shared that they received compliments while wearing this. A couple of users complained about the tad wide width of the Reebok Furylite Sole. Some felt discomfort as blisters formed on their heel. Not suitable for all day wearing because it does not have enough support, disclosed by one reviewer. One user criticized the shoelace that cannot be adjusted to make it tighter. The Reebok Furylite Sole features a unique style exclusively for women, inspired by the famous Instapump Fury. It carries a cool fabric upper, with cut-out on the sides and slip-on design suitable for people who are on the move. With its breathable feature, comfortable outsole, and a versatile modern design, this sneaker is apt for buyers who are looking for an easy kick that can be paired with anything. Reebok constantly innovates and provides quality products to boost one’s performance. They are known to offer exceptional products in sports, such as gears, clothing, accessories, and footwear. From the world of athletics, Reebok was able to cross the bridge that delineates sports and casual footwear. Instapump Fury, a real icon, was released in 1994 featuring a futuristic design with black/citron/red colorway. It was designed by Steven Smith, one of the best shoe designers who also had the chance to work with New Balance, Adidas, Fila and for Nike in the mid-90s. Aside from its outrageous design, the Instapump Fury also delivers incredible comfort. It features Reebok’s popular technologies, such as Pump and Hexalite cushioning. RBK decided to re-launch an updated version stirred from the classic Instapump Fury. They released the Furylite in 2015 that features an elite look with lightness and durable materials. The Furylite Sole is a slip-on iteration exclusively for the women that has lightness, comfort and modern appeal. The low-top Reebok Furylite Sole features a futuristic profile with modern comfort. It has cut-out on the sides with textile and mesh upper to keep the superb ventilation. The versatile design of this shoe can be matched with almost anything. This lifestyle eye-catching sneaker is a perfect pair for ladies who are always on the move. Most wearers don this with joggers, jeans, shorts, skirts in any color, almost anything won’t clash with its adaptability. 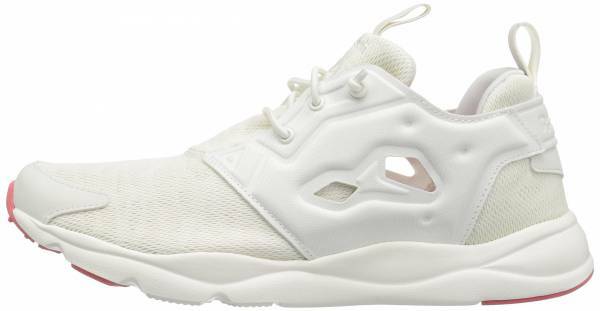 The Reebok Furylite Sole is a woman-exclusive pair that is available in sizes 4 to 15 US in medium width. This pair generally runs true to size. It features a bungee lace-up closure for easy slip on and off and adjustable fit. Pull tabs are present on the heel and tongue in aiding the wearers in putting on this pair. The futuristic look of the Reebok Furylite Sole makes this pair very notable for many buyers. Inspired by the very wild Instapump Fury, the Furylite Sole carries quite similar profile, but without the air bladder and the hexalite/carbon fiber shank. The Reebok Furylite Sole weighs 8 oz. The outsole is called 3D-Ultra-lite that provides lightness and easy to slip-on. It has the molded quarter panel with mono-mesh window detail. The sockliner is padded with EVA foam to provide cushioned comfort. The low-top profile provides freedom in mobility.